Make your party shine this holiday season with these stand-out creative invitation ideas. Most businesses have wised up to the fact that the only way to stand out in the era of email is to deliver a paper invite for their events – and you can’t afford to be any different. Whether you’re planning a shindig to thank your clients, or simply want your regular holiday celebrations to shine, try these 10 super-creative ways to personalise your invites, and watch the RSVPs flood in. Make your invitations more fun by using party favors to deliver the details of your bash. Tie a Square Business Card with your information on it to the neck of a balloon or party blowout with the date and details of your event printed on. Printing your invitation graphic in retro-style red and cyan anaglyph 3D onto a Postcard is easier than it looks, and seriously impressive. Include a pair of cardboard 3D glasses with each invitation, and you’ll give your guests a hit of nostalgia and achieve instant stand-out, all without blowing the budget. In your future… I see… a PARTY! Prove your guests are destined to attend your shindig by printing your invitations on Flyers folded into paper fortune tellers. Under each section, add the who, when, where and why of your party – or give a range of fortune-telling options suited to your brand that all lead to one place: your big holiday happening. Weave a way of driving customers to your website into your invitations by creating a word hunt that gives the details of your party. Print the details of your event onto Notecards with a few keywords missing that can be found on your site. For example: ‘Dress code: _______________ (Search Business Cards, and insert the last two words below Shop Business Cards By Paper)’. Add to the intrigue by going Luxe for your cards and closing your envelopes with a wax seal. Forget a plain party invite – our Flyers are completely customizable, which means you can create a poster that reflects the theme of your party. 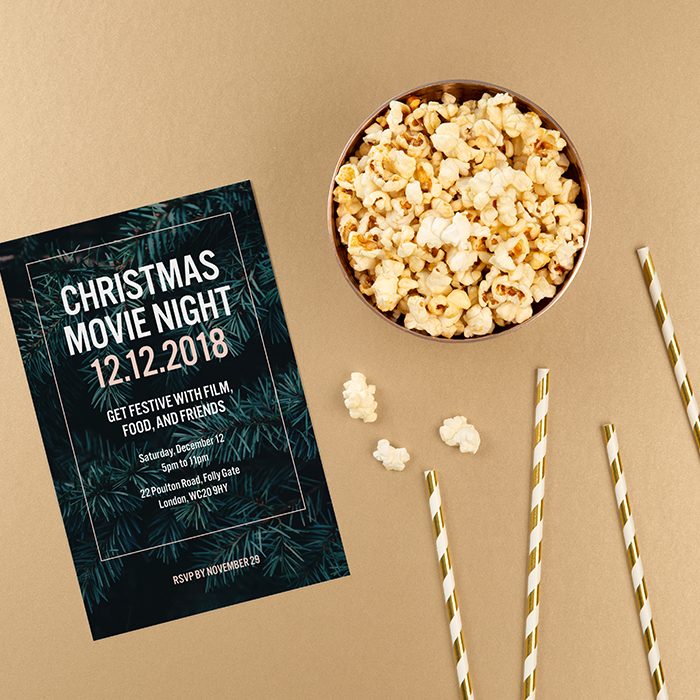 Whether you choose to design a movie poster, a pastiche of a novel cover, or a tongue-in-cheek festive round robin complete with office family photo, a poster-style invite gives you plenty of space to let your creative juices flow. You can also leave one side blank to add a personalized touch via a handwritten message. If you’re planning on holding a Secret Santa, send each guest their match on a personalized Postcard with a picture of the guest on one side and a list of their ‘likes’ printed on the other. ‘Sarah likes cheese, David Bowie and the crying cat emoji,’ should be enough to give them a few gift ideas. Everybody likes presents, and including a gift with your invitation should ensure a great turnout. Print your party details onto one of our square Business Cards, and nestle it in the bottom of a miniature gift box. Add some shredded paper and a small gift – such as a brownie, pin badges featuring your designs or some holiday-themed Stickers – and your guests will be excited to see what might be on offer at your party. Of course, your winning personality should be more than enough of a draw to ensure a great turnout. But offer your guests the chance to win a cool prize too, and they’re more likely to make the effort. Turn some MiniCards into raffle tickets, with the prizes printed on one side and each guest’s lucky number on the other, to be drawn at your event, and watch the RSVPs roll in. Get creative with our Business Cards by turning them into VIP passes. Add the details of your party on one side, and the guest’s name written large on the other. You could even add a lanyard to add to the air of exclusivity and, if you’re feeling extra creative, adding a MiniCard designed to look like an admission ticket will cement the theme. Our Luxe Letterhead takes business stationery to the next level, and is ideal for adding some pizzazz to your party invites, too. Create a festive letterhead design, and handwrite (or print, using a calligraphy-style font such as Champignon or Pinyon Script) your invitation. Take it to the next level by rolling up each invitation, adding a wax seal and ribbon, and shipping in a cardboard tube to add that olde-worlde royal-announcement vibe to your event. That fortune teller thingy is amazing. Love that idea.